A foot injury put a halt to the amount of training I would have love to have dedicated to accomplishing a quality finish time, so this race was just a matter going easy and getting in a solid training day for my retirement Ironman to come in a few months from now at the Ironman World Championship. With the hopes my foot will be somewhat better then. 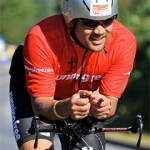 I had an enjoyable day and it indicated to me that this Ironman journey does need to come to an end soon. Yes, certainly not quick. But I’ll take it. I did not swim all year until my race at the Welland Half Swim/Bike, and my 50 minute swim there let me know very quick that I needed to get into the water for some kind of training. My shoulders are not getting better with age, so as in previous years, swim training was all about shoulder management. In July, I got into the pool for some 2x per week sessions, and as I was doing swim/bike races, I saw some improvement and knew I could easily be in the low 1:30’s and if the shoulders felt good and I put forth a bit of effort, into the 1:20’s. The swim this year at Tremblant was the roughest one I’ve been a part of in all my 3 times there, and made even more fun by the fog during the first half. It was impossible to see from one buoy to the next. Regardless, I swam with a feeling of calm and enjoyment, knowing that this would be my last Ironman swim in a wetsuit, and second last one ever. One look at this time and you’ll know I was not in a rush. 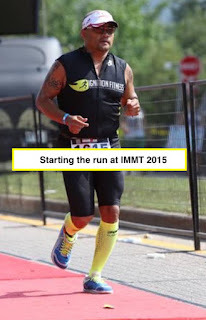 I took my time getting from the water to the change tent (barefoot running is a killer on my injured foot but I was fully styling with my Team Running Free top), then I decided to hit the porta-potty before heading out for the bike. The QR Illicito did its part today for sure. I rode easy and still finished the first 90km of the bike in sub 3 hrs (approximately 2:57) with an average power of 147w – I am fairly certain that the low reading is due to my continuing Garmin Vector calibration issues. I particularly loved the “tough” back section of the course, and while the heat was starting to hit it’s peak (30+ degrees) I felt good (probably due to the light effort). I toyed with the idea of pushing the pace a bit to come in under 6 hrs but a stop at special needs, and two pee stops curtailed those thoughts. The first pee stop indicated that I better get in some more fluids in the system. I rode the back section strongly again, and finished the bike in 6:20:15 – however, I actually thought I rode it in 6:09, but forgot my bike computer had the automatic stop engaged so I did not factor in those two pee breaks. No big deal, no records were going to be set today anyway. More casual changing here. My foot was not in a happy place getting off the bike so I was stalling a bit. I made sure to check that my timing chip was around my ankle this year and off I went. Just before exiting, a volunteer offered to rub me down with sunscreen and I obliged. A perfect application to the head too. Awesome! Nothing too mind blowing here. This was all all about foot maintenance. This meant that I planned regular intervals of walk breaks to make sure I could get through the entire run, and not just run til my foot blew up. There were various combinations of 2 and 1’s, working right up to 20 and 1’s. I just went with how the foot felt. The 24 and 35 km mark were particularly painful, but a bit of extended walking did the trick. I had a really good spell at the far turnaround and making my way back to the finish and just went with it and enjoyed the feeling. Plus, I was inspired by the fact that an athlete that I coached and was doing her first Ironman, looked to be running strong every time I saw her. You Rocked It out there Andrea! I was satisfied with the 5:21 given the fact that I couldn’t do any runs longer than 90 minutes. Crossed the finish line, got my finisher medal, hat and t-shirt, and continued on to get some Sleeman beer and poutine – one of the many perks of this incredible race at Mont-Tremblant. This is arguably one of the top three places in the World to do an Ironman. You will not regret racing here if you haven’t done so already. After my post-race food and drink reward, I continued on to get a massage. With my daughter passed out after a long day, I gathered all my gear bags, got my bike, did quick change and walked my stuff over to the handy Cabriolet gondola, and rode it up the mountain to my hotel at the top of the gondola. I headed back out to catch my old Ironman partners (John and Angus) finish their day. I was concerned for my pal Angus, but he knows how to get himself across the finish line and did so with 20 minutes to spare. 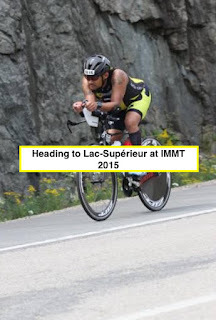 Angus heading out for lap 2 of the bike at IMMT. It was great to have them and their families here for the last Ironman the three of us will ever do together again. We’ve raced at least 10 of these Ironman races together and it was a great way to end it off with our kids racing and playing together.